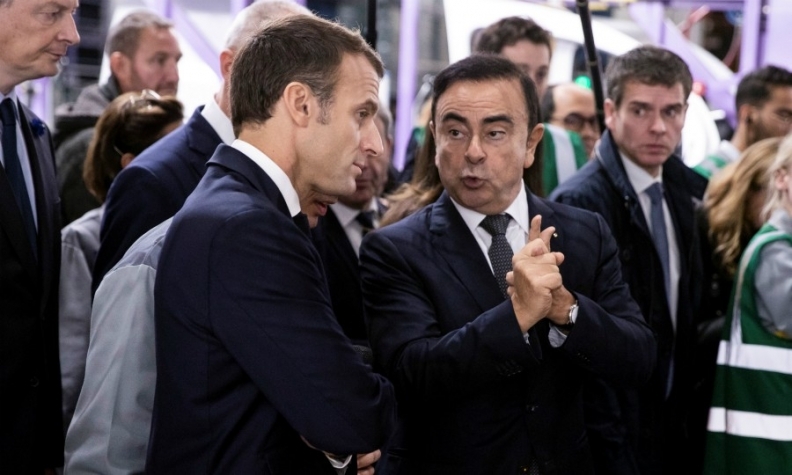 French President Emmanuel Macron, left, appeared with Carlos Ghosn at the Renault Maubeuge Construction Automobile plant on Nov. 8. PARIS -- France is seeking an interim leader for Renault SA, distancing itself from CEO Carlos Ghosn after he was arrested in Japan on allegations of financial misconduct. Ghosn was arrested on Monday in Japan over allegations he under-reported income of about US$44 million at Nissan Motor Co., where he was chairman. The bombshell developments leave Renault without a leader and raised questions about the future of the Renault-Nissan-Mitsubishi Alliance he led. Le Maire will meet with Renault management and board members later Tuesday to decide on interim governance for the French carmaker, he said, singling out COO Thierry Bollore as having “great qualities” and able to step in. The French government will also seek evidence from Japanese authorities, he said, after Nissan conducted an internal investigation triggered by an internal whistleblower. Before Ghosn’s shock arrest, the French government had been pushing to cement the alliance, which currently binds the two carmakers together through complex cross-shareholdings, so it would survive after his tenure ended in 2022. Those plans have now been trashed, forcing the French and Japanese sides to find a path forward with out him. In Paris, the board of Renault and the government of President Emmanuel Macron were both caught unaware by the allegations, according to people familiar with the matter. Macron and Ghosn appeared together at a plant tour in Maubeuge, France, on Nov. 8. Some people at Renault echoed questions raised in Japan as to whether Nissan CEO Hiroto Saikawa was carrying out a palace coup. Despite this, Ghosn may lack support to survive the charges emanating from Japan. 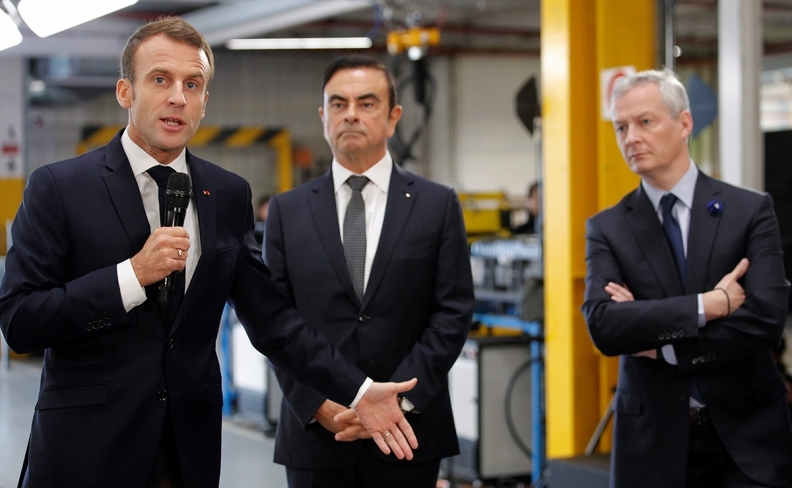 Ghosn (right) is pictured in discussion with French President Emmanuel Macron during a tour of Renault's Maubeuge plant in France. A Renault spokeswoman declined to comment on the minister’s plans. The state has clashed with Ghosn in the past over his compensation. After negotiations earlier this year, Ghosn was reappointed as Renault CEO for another four years. At the time, Bollore was named as COO, allowing Ghosn to focus on the future of the two-decade alliance that has forged deep cooperation between the partners. The French government will seek evidence from Japanese authorities, Le Maire said, after Nissan conducted an internal investigation following a tip-off by a company whistleblower. France checked into Ghosn’s tax records in France and found “nothing particular,” he said. The minister reiterated that France would seek to protect the Franco-Japanese alliance, without specifying how. Nissan accuses Ghosn of understating his income for years, and misusing company funds for personal use. Renault’s board plans to meet Tuesday evening Paris time, a spokesman for the company said. Renault’s board plans to meet Tuesday evening Paris time, a spokesman for the company said.